The Green Party has unveiled the three politicians fighting for nomination as its London mayoral candidate. Labour's Ken Livingstone and Conservative incumbent Boris Johnson are to reprise their 2008 contest at the election next year. Liberal Democrat Lembit Opik will also run. Now the Greens have whittled their list down to three names - Shahrar Ali, Farid Bakht and Jenny Jones. The party said the choice would "reinforce equalities credentials". A spokeswoman explained: "The Greens believe having two ethnic minority candidates and one well-known female former deputy mayor will inject a new vibrancy into the mayoral campaign." Ms Jones, a Green Party Assembly Member, said: "The May 2012 election will be an opportunity for us to explain our alternative to the disastrous cuts programme of the coalition government and explain that going green creates jobs, saves money and protects the planet." As a member of the Metropolitan Police Authority board, Ms Jones has been outspoken on policing matters. Mr Ali, the party's co-ordinator from 2004 to 2009, said: "I'm standing for selection as the Greens' mayoral candidate to provide voters with a strong, green alternative to business-as-usual politics." 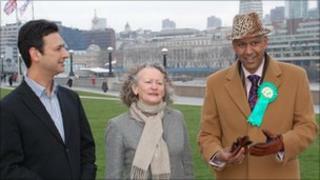 The candidate, sporting a leopard-skin hat at the launch, added: "As a lifelong Londoner, I advocate radical, green solutions to the everyday problems faced by us all." Mr Bakht, the party's former international co-ordinator and parliamentary candidate for Bethnal Green at the general election, said: "My priority is to widen our appeal to people from all communities - including the working class within London. "I want to demolish the myth that we are a white, middle class party interested only in a narrow agenda and not in tune with people's everyday lives." Sian Berry, who ran for mayor in 2008, said: "Running for mayor is tough - it's an uphill battle competing for space and attention with the other candidates."